LoadTest (NON-ATOMIC): ThreadedTest: testOneSecondResponse (ExampleTestCase.ExampleTestCase): 1.0150001049 sec. LoadTest (NON-ATOMIC): ThreadedTest: testOneSecondResponse (ExampleTestCase.ExampleTestCase)(repeated): 10.0 sec. We already discuss that V-model is the basis of structured testing. However there are few problem with V Model. V Model Represents one-to-one relationship between the documents on the left hand side and the test activities on the right. This is not always correct. 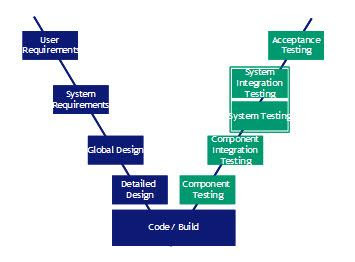 System testing not only depends on Function requirements but also depends on technical design, architecture also. Couple of testing activities are not explained in V model. This is a major exception and the V-Model does not support the broader view of testing as a continuously major activity throughout the Software development lifecycle. Paul Herzlich introduced the W-Model. In W Model, those testing activities are covered which are skipped in V Model. 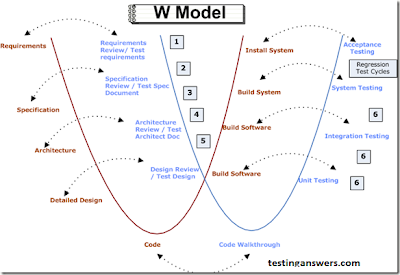 The ‘W’ model illustrates that the Testing starts from day one of the of the project initiation. If you see the below picture, 1st “V” shows all the phases of SDLC and 2nd “V” validates the each phase. In 1st “V”, every activity is shadowed by a test activity. The purpose of the test activity specifically is to determine whether the objectives of that activity have been met and the deliverable meets its requirements. 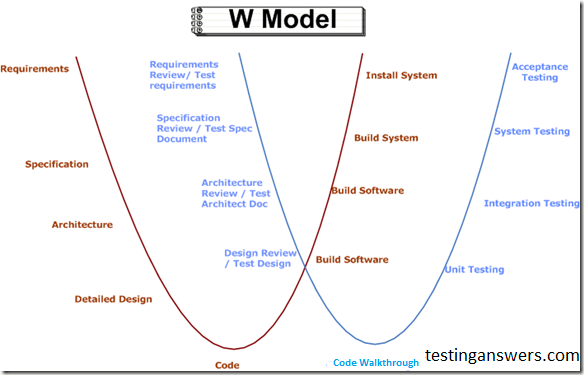 W-Model presents a standard development lifecycle with every development stage mirrored by a test activity. On the left hand side, typically, the deliverables of a development activity (for example, write requirements) is accompanied by a test activity test the requirements and so on. Fig 2: Each phase is verified/validated. Dotted arrow shows that every phase in brown is validated/tested through every phase in sky blue. Point 1 refers to - Build Test Plan & Test Strategy. Point 2 refers to - Scenario Identification. Point 5 refers to – review of test cases and update as per the review comments. So if you see, the above 5 points covers static testing. Point 6 refers to – Various testing methodologies (i.e. Unit/integration testing, path testing, equivalence partition, boundary value, specification based testing, security testing, usability testing, performance testing). After this, there are regression test cycles and then User acceptance testing. Conclusion - V model only shows dynamic test cycles, but W models gives a broader view of testing. 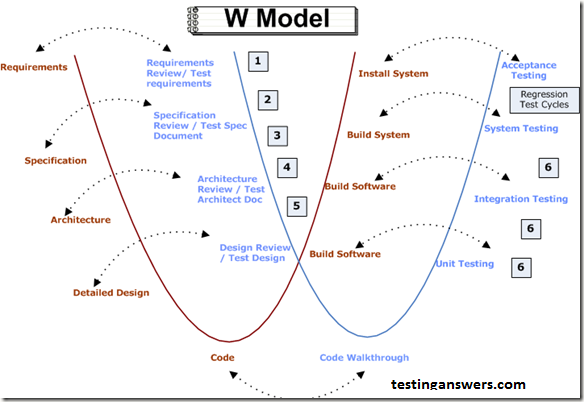 the connection between the various test stages and the basis for the test is clear with W Model (which is not clear in V model). 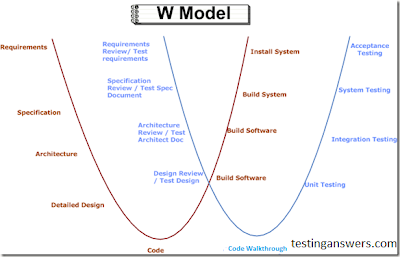 You can find more comparison of W Model with other SDLC models Here. You will find out this is a great model! End users express their whish for a solution for one or more problems they have. In testing you have to start preparation of your user tests at this moment! You should do test preparation sessions with your acceptance testers. Ask them what cases they want to test. It might help you to find good test cases if you interview end users about the every day cases they work on. Ask them for difficulties they meet in every days work now. Give feedback about the results of this preparation (hand the list of real life cases, the questions) to the analyst team. Or even better, invite the analyst team to the test preparation sessions. They will learn a lot! write down what they found out and usually this is reviewed by Development/Technical Team, end users and third parties. In testing you can start now by breaking the analyses down into 'features to test'. One 'feature to test' can only have 2 answers: 'pass' or 'fail'. One analysis document will have a number of features to test. Later this will be extremely useful in your quality reporting! Look for inconsistency and things you don't understand in the analysis documents. There’s a good chance that if you don't understand it, neither will the developers. Give Feedback your questions and remarks to the analyst team. This is a second review delivered by testing in order to find the bug as early as possible! Development translates the analysis documents into technical design. Developers program the application and build the application. - Note: In the classic waterfall software life cycle testing would be at the end of the life cycle. The V-model is a little different. We already added some testing review to it. These are the tests development performs to make sure that all the issues of the technical and functional analysis is implemented properly. Every time a developer finishes a part of the application he should test this to see if it works properly. Once a set of application parts is finished, a member of the Development team should test to verify whether the different parts do what they have to do. Once these tests pass successfully, system testing can start. In this testing level we are going to check whether the features to test, destilated from the analyses documents, are realised properly. Best results will be achieved when these tests are performed by professional testers. In this testing level each part (use case, screen description) is tested apart. Different parts of the application now are tested together to examine the quality of the application. This is an important (but sometimes difficult) step. Typical stuff to test: navigation between different screens, background processes started in one screen, giving a certain output (PDF, updating a database, consistency in GUI,...). System integration testing also involves testing the interfacing with other systems. E.g. if you have a web shop, you probably will have to test whether the integrated Online payment services works. These interface tests are usually not easy to realise, because you will have to make arrangements with parties outside the project group. Here real users (= the people who will have to work with it) validate whether this application is what they really wanted. During the project a lot off interpretation has to be done. The analyst team has to translate the wishes of the customer into text. Development has to translate these to program code. Testers have to interpret the analysis to make features to test list. Tell somebody a phrase. Make him tell this phrase to another person. And this person to another one... Do this 20 times. You'll be surprised how much the phrase has changed! This is exactly the same phenomenon you see in software development! Let the end users test the application with the real cases you listed up in the test preparation sessions. Ask them to use real life cases! And - instead of getting angry - listen when they tell you that the application is not doing what it should do. They are the people who will suffer the applications shortcomings for the next couple of years. They are your customer! - The basic objective of writing test cases is to ensure complete test coverage of the application. The most extensive effort in preparing to test a software, is writing test cases. Writing effective test cases is a skill and that can be achieved by experience and in-depth study of the application on which test cases are being written. A test case is a detailed procedure that fully tests a feature or an aspect of a feature. Whereas the test plan describes what to test, a test case describes how to perform a particular test. Test cases must be written by a team member who thoroughly understands the function being tested. Any CMMi company would have defined templates and standards to be adhered to while writing test cases. 1. Use Simple and Easy-to-Understand language. 2. Use Active voice while writing test cases For eg. - Navigate to the account Summary page. 3. Use words like “Verify” / ”Validate” for starting any sentence in Test Case description (Specially for checking GUI) For eg. - Validate the fields available in _________ screen/tab. These includes specification-based and experienced-based techniques. These use external descriptions of the software, including specifications, requirements, and design to derive test cases. These tests can be functional or non-functional, though usually functional. Tester needs not to have any knowledge of internal structure or code of software under test. Models, either formal or informal, are used for the specification of the problem to be solved, the software or its components. From these models test cases can be derived systematically. The knowledge and experience of people are used to derive the test cases. Knowledge about likely defects and their distribution. Also referred as structure-based techniques. These are based on the internal structure of the component. Tester must have knowledge of internal structure or code of software under test. Information about how the software is constructed is used to derive the test cases, for example, code and design. The extent of coverage of the software can be measured for existing test cases, and further test cases can be derived systematically to increase coverage. The risk in the project is under acceptable limit. Number of high priority bugs. The Software Assurance Technology Center (SATC) in the Systems Reliability and Safety Office at Goddard Space Flight Center (GSFC) is investigating the use of software error data as an indicator of testing status. Items of interest for determining the status of testing include projections of the number of errors remaining in the software and the expected amount of time to find some percentage of the remaining errors. To project the number of errors remaining in software, one needs an estimate of the total number of errors in the software at the start of testing and a count of the errors found and corrected throughout testing. There are a number of models that reasonably fit the rate at which errors are found in software, the most commonly used is referred to in this paper as the Musa model. This model is not easily applicable at GSFC, however, due to the availability and the quality of the error data. At GSFC, useful error data is not easy to obtain for projects not in the Software Engineering Laboratory. Of the projects studied by the SATC, only a few had an organized accounting scheme for tracking errors, but they often did not have a consistent format for recording errors. Some projects record errors that were found but did not record any information about resources applied to testing. The error data frequently contained the date of entry of the error data rather than the actual date of error discovery. In order to use traditional models such as the Musa model for estimating the cumulative number of errors, one needs fairly precise data on the time of discovery of errors and the level of resources applied to testing. Real world software projects are generally not very accommodating when it comes to either accuracy or completeness of error data. The models developed by the SATC to perform trending and prediction on error data attempt to compensate for these shortcomings in the quantity and availability of project data. In order to compensate for the quality of the error data, the SATC developed a software error trending models using two techniques, each based on the basic Musa model, but with the constant in the exponential term replaced by a function of time that describes the 'intensity' of the testing effort. The shape and the parameters for this function can be estimated using measures such as CPU time or staff hours devoted to testing. The first technique involves fitting cumulative error data to the modified Musa model using a least squares fit that is based on gradient methods. This technique requires data on errors found and the number of staff hours devoted to testing each week of the testing activity. The second technique uses a Kalman filter to estimate both the total number of errors in the software and the level of testing being performed. This technique requires error data and initial estimates of the total number of errors and the initial amount of effort applied to testing. The SATC has currently examined and modeled error data from a limited number of projects. Generally, only the date on which an error was entered into the error tracking system was available, not the date of discovery of the error. No useful data was available on human or computer resources expended for testing. What is needed for the most accurate model is the total time expended for testing, even if the times are approximate. Using the sum of reported times to find/fix individual errors did not produce any reasonable correlation with the resource function required. Some indirect attempts to estimate resource usage, however, led to some very good fits. On one project errors were reported along with the name of the person that found the error. Resource usage for testing was estimated as follows: A person was estimated to be working on the testing effort over a period beginning with the first error that they reported and ending with the last error that they reported. The percentage of time that each person worked during that period was assumed to be an unknown constant that did not differ from person to person. Using this technique led to a resource curve that closely resembled the Rayleigh curve (Figure 1). On most of the projects, there was good conformity between the trend model and the reported error data. More importantly, estimates of the total number of errors and the error discovery parameter, made fairly early in the testing activity, seemed to provide reliable indicators of the total number of errors actually found and the time it took to find future errors. Figures 2 shows the relationship between reported errors and the SATC trend model for one project. The graph represents data available at the conclusion of the project. This close fit was also found on other projects when sufficient data was available. On another project, different estimates of the total number of errors were obtained when estimates were made over different testing time intervals. That is, there was inconsistent agreement between the trend model and the error data over different time intervals. Through subsequent discussion with the project manager it was learned that the rate of error reporting by the project went from approximately 100% during integration testing to 40% during acceptance testing. Furthermore, there was a significant amount of code rework, and testing of the software involved a sequential strategy of completely testing a single functional area before proceeding to test the next functional area of the code. Thus, the instability of the estimates of the total errors was a useful indicator of the fact that there was a significant change in either the project's testing and reporting process. Figure 3 shows the results for this project. Note the change in slope of the reported number of errors occurring around 150 days. The data curve flattens at the right end of the curve due to a pause in testing, rather than a lack of error detection. This project is still undergoing testing. If error data is broken into the distinct testing phases of the life cycle (e.g., unit, system, integration), the projected error curve using the SATC model closely fits the rate at which errors are found in each phase. The code being tested is not being substantially altered during the testing process, especially through the addition or rework of large amounts of code. All errors found are reported. All of the software is tested, and testing of the software is uniform throughout the time of the testing activity. Condition 1 is present to ensure that the total number of errors is a relatively stable number throughout the testing activity. Conditions 2 and 3 are present to ensure that the estimate of the total number of errors is in fact an estimate of the total errors present in the software at the start of testing - no new errors are introduced during testing. If testing is not "uniform" then the rate of error discovery will not necessarily be proportional to the number of errors remaining in the software and so the equation will not be an appropriate model for errors found. No attempt will be made here to make precise the meaning of the word "uniform". The SATC developed this model rather than using the standard Musa model because it seems less sensitive to data inaccuracy and provides for non-constant testing resource levels. An additional benefit from this work is the application of the Rayleigh curve for estimating resource usage. Future work by the SATC will continue to seek a practical balance between available trend analysis theory and the constraints imposed by the limited accuracy and availability of data from real-world projects.